Have you ever watched the TV show “Extreme Couponers”, got super excited to start couponing and save hundreds of dollars, only to realize that you have no idea what you’re doing? Many couponing experts make couponing for beginners difficult, or preach that you need to spend hours each week clipping coupons to save a few dollars. That was me a few years ago. I bought into the hype of extreme couponing to save money. However, couponing for 40 hours a week, buying a ton of paper that went mainly to waste, and stressing over a huge stockpile just wasn’t my style. Couponing is a great way to save money on groceries and other everyday items. You may think it takes a lot of work to start couponing. Thankfully, that’s not the case. If you’re looking for ways to fill your grocery cart and leave the store paying almost nothing, this post is not for you. It’s simply not worth the time spent, in most cases, to go to that extreme. However, this post does share some couponing tips for beginners that will save you money at the store each week. Often the best way to save money with coupons is to use coupon apps. Couponing apps put the coupons right on your phone, which means you can save money and reduce your paper usage. If you’re trying to save money on groceries, items you need for your home, and more, you don’t have to be extreme. Here are the top nine coupon apps for beginners to save money. I love Ibotta for two reasons. One, you save and get back real money. While some grocery rebate apps may pay you in gift cards, credits, or points, Ibotta lets you transfer money to your bank account. Two, I love Ibotta because it typically has coupons and money-back offers for things that I actually buy. Need bread that week? I can get money back because of Ibotta. Forgot some milk? Ibotta has a coupon for that, too. And the best part about Ibotta? It’s incredibly simple to use. Seriously, my four year old knows how to add the offers to our “cart”, and she loves being able to scan our grocery receipts. Ibotta also works with more than just grocery stores. The app works with over 350 retailers. If you’re booking a hotel room, grabbing some makeup, or even buying movie tickets, Ibotta likely has a cash-back opportunity for you. You can redeem payments once your balance hits $20. Ibotta also gives you $10 just for signing up. Check out our Ibotta review for a full breakdown of the service. A good list of couponing websites for beginners would be incomplete without Checkout51. I also use this app, mainly for the savings I can’t find on Ibotta. Something I’ve noticed with Checkout51 is that it will have coupons for items you generally can’t find coupons for like organic food or supplements. If you’re a health nut that likes to save money, Checkout51 is the app for you. Another great perk to the Checkout51 app is that you can shop anywhere. Unlike Ibotta, who only partners with specific stores, Checkout51 allows you to take a picture of your receipts from any store. As long as you have the item on your receipt, you’ll get cash back. It’s easy to use and great for those who may live in rural areas and don’t have access to certain stores. Like Ibotta, Checkout51 lets you redeem cash once you hit a $20 balance. SavingStar’s motto is “No clipping, no printing, no mailing”, and they’re right. You don’t have to do any of those if you have their app. There are more than 70,000 locations that accept SavingStar, and the app works with retailers like CVS, Kroger, Target, and Walmart. All you have to do is sign up, link your store cards, select the rebates you want to take advantage of, and use your store card at check out. That’s it! From there, your savings is added to your SavingStar account. You can withdraw your money as soon as the balance hits $20 dollars. This isn’t hard to do if you grocery shop on a regular basis. Plus, this coupon app pays you in cash so you don’t have to worry about dealing with points or perks. While Shopkick (available in both Android and iOS platforms) doesn’t offer you cash back, they do offer some incredible gift card options. But I love the app for a few reasons other than the payment. Shopkick is one of the few apps that I can use to get points for simply walking into a store. Considering the fact that, during my weekly grocery trips, I typically shop at two to three stores, those points add up. Basically, you don’t even have to buy anything to earn points, also known as “kicks.” While it may take a while to save enough points for a gift card, it’s easy and hassle-free to open the app while you walk into the store. I also like the thrill of scanning a barcode to see if I get points. I’ve been able to get quite a few gift cards through Shopkick for stocking stuffers or to splurge on myself without feeling guilty. It’s an easy way for me to cut costs while treating myself or those I love. Swagbucks is the ultimate couponing for beginners app. If you haven’t heard about Swagbucks, you are missing out. It’s such an easy app to use, and you can earn gift cards quickly. With Swagbucks, you will have to print your coupons. Each coupon is worth 25 SBs (or points), and you can clip and print up to 50 coupons at a time. If you want to try physical coupons, but don’t want the hassle of buying multiple newspapers and inserts, this is a great option. You can redeem points for either cash or gift cards. I prefer gift cards, and can typically get two to three gift cards every six weeks without spending a ton of time on Swagbucks. If you prefer to shop online, Swagbucks is a great option to save money. The site claims you can shop at over 1,500 online retailers to get cash back on your shopping. In some cases you can get up to ten percent cash back. Like other coupon apps, Swagbucks gives you $10 to start and you can redeem points at any time. Check out our Swagbucks review to get a more in-depth review of the platform. BerryCart is a healthy eaters dream. This couponing app rewards you for eating wholesome and nutritious food. If you eat organic, gluten-free, non-GMO, or just love trying new healthy foods, you can save some serious money with this app. Trim is like a robot whose one goal is to save you money. The average Trim user saves $30 per bill! You can too. Trim connects to your bank account, finds ways to save you money on the memberships and subscriptions you don’t use and negotiates lower prices for you. Trim works with Comcast, Time Warner and more. Pay less and save more today with Trim. Couponing for beginners gets harder when you have dietary restrictions or when you don’t want to line your pantry with junk food. But with BerryCart, you can thrive on your diet and not cry every single time you see your grocery bill total. BerryCart works the same as Ibotta and Checkout51. You add the rebates to your cart, go shopping as usual, take a picture of your receipt, and the savings is then added to your account. You can transfer that money into your bank account at any time. Although they’re not grocery shopping apps, you can save quite a bit of money by using Groupon and LivingSocial. Both platforms are fairly similar so we’ll cover them as one. If you consider yourself a foodie, love trying new things in your area, or love to travel, you could score some incredible deals. In my area alone, I scored 60 percent off two tickets at a popular paintball arena, 50 percent off annual passes to my daughter’s favorite aquarium, and I got a pedicure and manicure deal for only $25. These are activities that I was already planning on doing, and I saved over $100 by checking with Groupon first. These are the ultimate coupons for those who love to have fun and treat themselves on a budget. LivingSocial is very similar to Groupon, but I’ve noticed that they have better deals on travel and goods, including products on Amazon. So if that’s where you want to save money, check out LivingSocial and see what they have. If you shop online fairly often, you’ve probably come across RetailMeNot. One of the original couponing and savings sites, RetailMeNot has an enormous database of coupons. From coupons for online pizza orders to coupons for those shoes you’ve been eyeing, you can find one for just about everything. It’s free to use, and all you have to do is a quick search for the specific coupons you want. For example, before my family rents a car, I look at RetailMeNot to see if any car rental places are running deals or specials. If they are, I get the coupon code from the site and input it at checkout to save some money. It’s that easy. Coupons.com is another great site that you can use for printable coupons. They also have coupon codes if you want to shop online, cash-back deals, and loyalty savings if you use store cards when you shop. You can use Coupons.com in conjunction with other apps, and earn even more cash back. I like to take a picture of my receipts with Ibotta, Checkout51, and Coupons.com to get as much back on my purchases as possible. It’s a great addition to the other apps, and can save you even more money without all the extra work. The above couponing websites for beginners provide a great way to save money on your shopping needs. However, you may have some questions on how to start using coupons to save money. Below are a few common questions people ask before they start using coupons. You can get coupons in a variety of ways. The most common are through your Sunday newspaper, directly from the store, or from manufacturers’ websites. Of course, you can use any of the above coupon apps to save money. This is of particular importance if you clip coupons as most apps allow you to organize deals. Find a method that works for you, but many use a coupon organizer (here are the best ones on Amazon). You should organize coupons by expiration date and product since this prevents you from missing out on a deal. It also keeps each section in your organizer item-specific. How much time should I spend finding coupons? Extreme couponing is a popular way to save money but it does take a lot of time. Spending considerable hours each week searching for coupons often has diminishing returns. Many of the above cash-back apps make couponing quite simple and can be done with little effort and time. It’s best to find a balance that works for you. Does each store have the same policy on coupons? Unfortunately not. Every store has their own specific policy on coupons. Some may not allow you to combine two different coupons. Others may limit you on how many you can use. It’s best to check your favorite stores’ policies before you start using coupons. How can I maximize savings? It’s also important that you refrain from buying anything you weren’t planning on buying. Using a coupon is great, but not if you weren’t planning on buying the item. 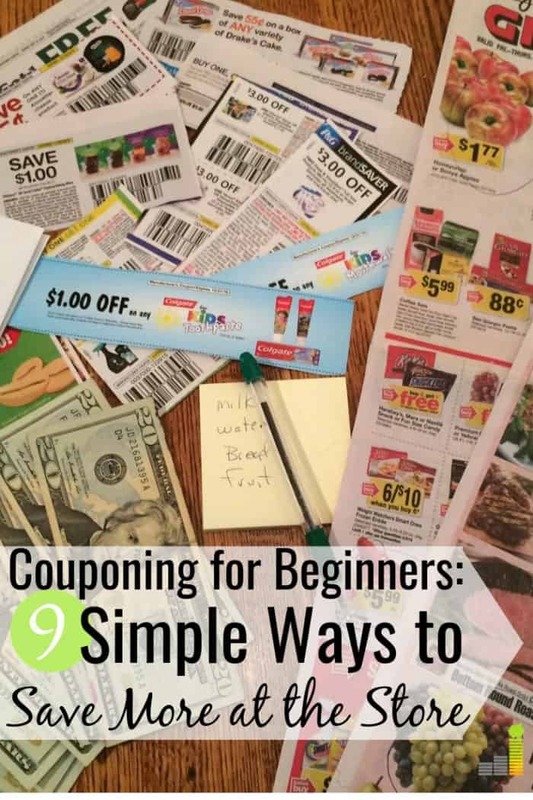 Despite some of the messages to the contrary, couponing for beginners doesn’t have to be time-consuming or complicated. You can start using coupons with little effort to save money and stretch your budget. If you want to save more money on your grocery shopping or other needs, many of the above apps make the process fairly simple. Find one that works for you and enjoy the savings! What are some other couponing tips for beginners you would recommend? How much time do you spend looking for coupons each week? What are some other ways to save money at the store? The post Couponing for Beginners: 9 Apps to Save Money when Shopping appeared first on Frugal Rules.